Continuing where AE Polysilicon: Preliminary Plan Approved left off, details regarding AE Polysilicon Corporation FBR feedstocks and process have emerged. A process description for lay persons was presented at the October 16, 2007, meeting of the Falls Township Board of Supervisors. The impure silicon powder (98% pure) or metallurgical silicon (mg-Si) will be converted via a process described in a handout distributed to the Supervisors into a 99.9999% pure pelletized product (granular polysilicon). Will the polysilicon only be six nines pure (6N)? Later in the meeting, there were tacit claims the polysilicon is appropriate for electronic grade semiconductor applications. Is this an apparent contradiction or an indication the polysilicon will be of higher purity than stated? The granular polysilicon produced by AE Polysilicon is a physical form perfect for continuous silicon wafer growth processes such as EFG (Edge-defined Film-fed Growth) and String Ribbon. I believe it is a kind of trade secret but we are going to purchase such type of metallurgical grade silicon from here. In the US. My interpretation of the here in Mr. Chang’s statement was at the KIPC or from a local source in Pennsylvania. I don’t think there is an arc furnace at the KIPC. I didn’t see a plant that resembled a silicon metal production facility, so my strong suspicion is the metallurgical silicon powder is sourced outside the KIPC in Pennsylvania. AE Polysilicon was established in 2006 to develop and commercialize polysilicon production using fluidized bed reactors and trichlorosilane as feedstock gas. AE Polysilicon also touts their FBR technology is an Environmentally friendly closed loop process. Looking at the preliminary plan, the area between each pair of cells could be for a TCS production cell or TCS gas storage. I consulted with a few experts on Polysilicon plants, but their review of the sketchy preliminary plan was inconclusive. The drawing had insufficient detail. Since then, I have learned AE Polysilicon will produce TCS onsite from a well informed, confidential source. This is logical considering the above claims of a closed loop process and the planned size of the facility. 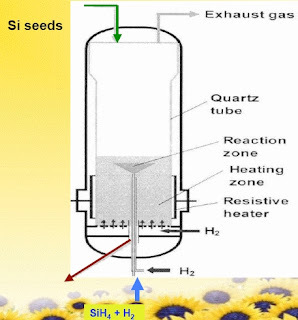 How and/or from whom will AE Polysilicon source the silane or trichlorosilane required by their Fluidized Bed Reactor technology? In reviewing this, I thought the silane part had been a mistake. At least until I noticed this figure in a presentation by Motech Solar (a division of Motech Industries Inc., TPO:6244) CEO Dr. Yuan-Huai Simon Tsuo first cited in AE Polysilicon: Preliminary Plan Approved. r process stage? Maybe this is not such a surprise since the AE Polysilicon team is purported to include ex-employees of Foster Wheeler and ASiMI. ASiMI is now REC Solar Grade Silicon LLC, a wholly owned subsidiary of Renewable Energy Corporation ASA (OSL:REC). AE Polysilicon has purchased and begun construction of the production facility at Keystone Industrial Port Complex (KIPC) in Fairless Hills, Pennsylvania. The AE Polysilicon website is back at AE Polysilicon or http://www.aepolysilicon.com/.